If you are lucky enough to have an Inglenook fireplace or an ornate Victorian mantlepiece in your room, then you already have in place one of the key elements that makes a room feel finished: the focal point. I get lots of questions about focal points, and so today we're diving into your most common questions. What is a focal point and why do I need one? The dictionary defines the focal point as "the centre of activity or interest" in a room; it is the first thing that the eye is drawn to when you enter a room; the first thing you notice. You see, the human brain doesn't cope well with all of the information it is sent by the eyes, and so it filters the information it receives. Having a focal point helps to guide the eye towards the most important part of the room, and this relaxes us and makes us feel calm. A decent focal point is essential for your stress levels and well-being! Common focal points are fireplaces, views from the window or pieces of artwork, although (as many of you write to ask me about) the focal point is often the TV. How do I know what my focal point should be? Some rooms have really obvious natural focal points, like a fireplace or a beautifully framed view for example. But sometimes the focal point isn't that obvious and you may need to go looking for it. Do you remember that home design programme with the architect, George Clarke, where he used to spray paint the whole room white before designing a space? He sprayed the walls, the floor, the windows, the bannisters- everything- white. This enabled him to show the homeowner the bare bones of the room, and highlighted where the main focal point and architectural features were. Now I'm not suggesting that you go and spray your room white; but you can use your imagination instead to similar effect. Visualise the space in your room, with all of the furniture removed or stripped back, and just the architectural features on show. What would immediately jump out at you? Where is your eye naturally drawn? This is often a good place to start. How do I emphasise the focal point? Once you have identified the natural focal point in your room, you need to bring attention to it. This can be done in several ways. If your focal point is a fireplace, dress the mantle with decorative objects, and place a mirror or artwork above it. Paint the chimney breast a contrasting colour to the rest of the room, making it clear where the eye should land. This room clearly has a beautiful window as its focal point, but it's crying out to have attention drawn to it. At the moment, the eye just bounces around the room, not knowing where to rest. Arranging furniture around a focal point is also a good way to emphasise where the star of the room is. People naturally navigate towards seating arrangements, and so placing your furniture facing your focal point emphasises this. Photographers use the concept of 'leading lines' to compose their images, where elements within the image lead the eye towards the focal point of a composition. The same principle can be used in interior design, by arranging furniture to point towards a focal point. What if I don't have a focal point? Especially in modern homes, focal points can be lacking. But a focal point doesn't have to be an architectural feature, or a wonderful view, and if you find yourself without somewhere for the eye to rest, you can create your own focal point relatively easily. Image via IdealHome.co.uk with permission. 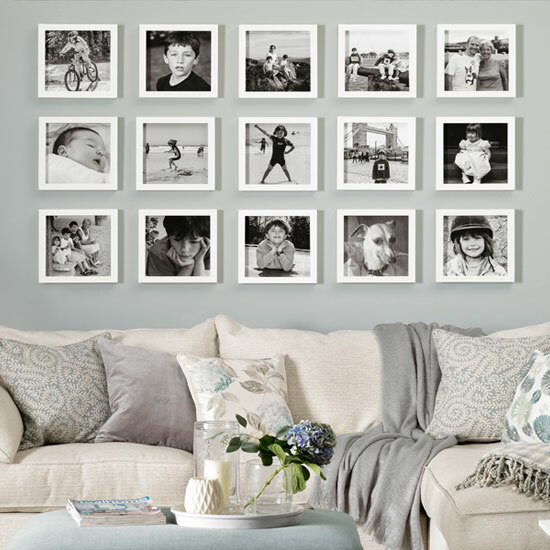 A large piece of imposing wall art, a grid of photographs or a gallery wall with objets d'interest is a sure fire way of drawing attention to an otherwise blank wall. Creating a feature wall with wallpaper can also have the same effect. So if you don't have a focal point in your room- worry not! This is a fairly easy thing to fix. Can I change the focal point if I don't like it? If you have a focal point which you dislike, and you really can't remove it, there are some things you can do to make it look less "bossy" in your room. Play down the existing focal point by keeping the colours around it the same colour as the focal point itself, so that it blends in rather than stands out. If possible, box the feature in, or place furniture, plants or a screen in front of it to lessen how obvious it is in the room. 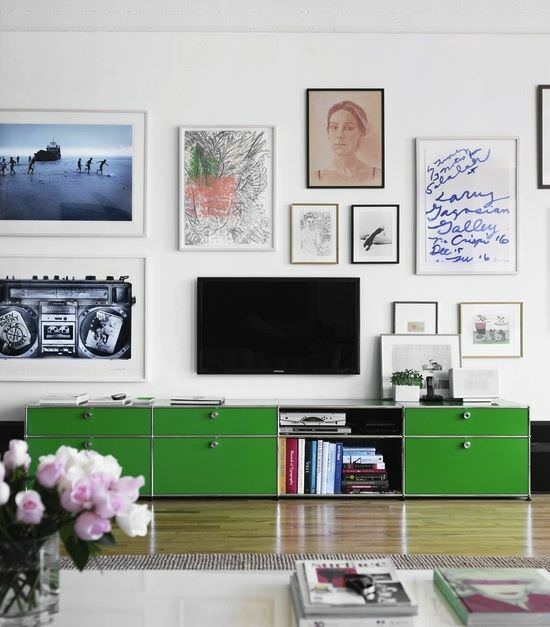 Once you've disguised your unwanted focal point, you need to create a new focal point in the room to draw the eye. Make the new focal point larger in scale, bolder in colour and more imposing than the original focal point. Direct all of the furniture towards the new focal point, and try to bring in some leading lines (see above) to draw the eye towards the new focal point. What if there is more than one focal point? I always advise people to choose a primary focal point, and to direct attention to it in the ways we've discussed above. But it's okay to have a second beautiful area to look at too. Just don't draw attention to it in quite the same way. What if the TV is the focal point? Well we got there. The biggy. This is the question that I get asked the most about focal points, and there is no one right answer. In many homes, the main purpose of a living room is to watch TV, and function has to be considered alongside the look of a room. After all, we are creating real homes for real people here! TVs are often wall mounted, and they are getting bigger and bigger, meaning that they are hard to ignore. To make matters worse, all of the furniture in the room is often positioned facing the TV, which further emphasises that as the star of the show. Now, you could put your TV inside a TV cabinet so that it is completely hidden from view when you are not watching it, but really, who can be bothered to be opening and closing doors all of the time? Creating a focal point above the TV also works well. In the image below, the wall has been painted the same colour as the TV, and an eye-catching piece of artwork is placed above to draw the eye upwards, and then up again to the light fixing above. Against the black wall, and with these other focal points in place, the TV is hardly noticeable. Getting a strong focal point right in your room brings a sense of calm and order to your home. Allow one focal point to shine, and let everything else sit back and take it easy. Have you used any of these tricks in your own home? What problems have you come across and how did you resolve them? Let us know in the comments below. Main Blog Image via IdealHome.co.uk with permission.